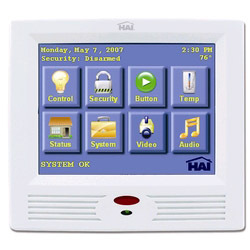 The OmniTouch provides a fun and affordable interface for HAI's Omni LT, Omni IIe, OmniPro II, home control systems. Customers can enjoy the one touch control of security, temperature, lighting, audio, and other home control functions via easy-to-recognize icons. 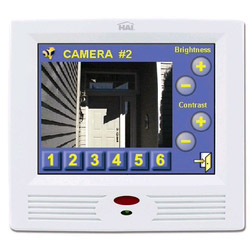 The unit features a 5.7 inch (14.5 cm) color, touch sensitive LCD screen with backlighting that adjusts automatically to ambient lighting conditions and turns off when not in use. 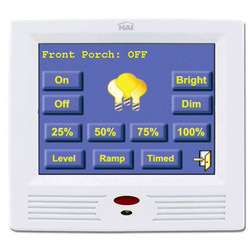 The two-color LED offers status at a glance, and there are selectable keyclick and beeper functions. OmniTouch Touchscreens are truly "plug and play" devices, which makes them easy to install. They don't require any programming and configure themselves. The touchscreen unit mounts flush with the wall, and is supplied with a white faceplate (ivory, almond and silver optional) that is a slim 3/8 inch for an elegant built-in look. 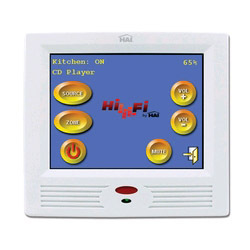 Programmable touchscreen remote control for intuitive operation of audio/video and home automation of the digital home, fully customizable. 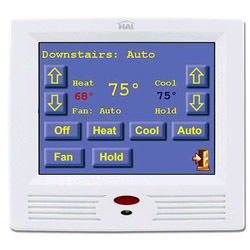 Heat pump thermostat, (2 heat/1 cool) with lighted LCD, accessories kit, manuals.